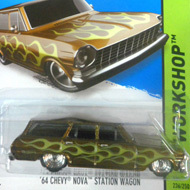 237/250 is part of the HW Workshop series and the the 2014 Super Treasure Hunt set. 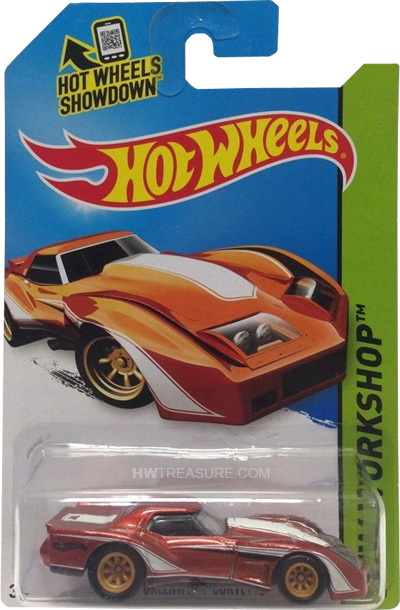 The Spectraflame copper Vette sports white graphics on the sides and top as well as a black Hot Wheels logo on the sides. The hood and trunk have a thick white stripe with “TH” in the trunk stripe. 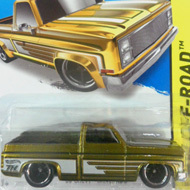 It has clear windows, a black interior, 8-spoke Real Rider wheels with tan rims, and a grey plastic Malaysia base. The Corvette made its debut in the Hot Wheels Racing 2012 series. It is based upon the custom cars built by John Greenwood that often feature wide bodies, wings, spoilers, and turbocharged engines.